(TibetanReview.net, Aug22, 2014) –Apart from global warming, pollution from ever increasing human and industrial waste as a result of rapid development are contributing to the Plateau of Tibet getting hotter, wetter and more polluted, threatening its fragile ecosystems and also putting at serious risk those who rely on them, according to a comprehensive environmental assessment carried out by the Chinese government. Released in Tibet’s capital Lhasa on Aug 9 by the Chinese Academy of Sciences (CAS) and the government of Tibet Autonomous Region, the assessment has found that precipitation had risen by 12% since 1960 while temperatures had soared by 0.4 °C per decade — twice the global average – reported nature.com Aug 19. In addition, glaciers are shrinking rapidly and one-tenth of the permafrost has thawed in the past decade alone. This means that the number of lakes has grown by 14% since 1970, and more than 80% of them have expanded since, devastating surrounding pastures and communities. The Tibetan Plateau feeds Asia’s biggest rivers, so these problems are likely to affect billions of people, the report was cited as saying. The plateau and its surrounding mountains cover 5 million square kilometres and hold the largest stock of ice outside the Arctic and Antarctic; the region is thus often referred to as the Third Pole. But, according to the assessment report, like the actual poles, it is increasingly feeling the effects of climate change, while rapid development is putting it doubly at risk. The assessment report is said to call on the Chinese and Tibetan governments to make conservation and environmental protection top priorities and to strike a balance between development and conservation. While there are certain positive effects resulting from global warming on the Tibetan Plateau, the dangers, compounded by human and development activities, are very serious. “The Tibetan plateau is getting warmer and wetter,” Yao Tandong, director of the CAS Institute of Tibetan Plateau Research in Beijing, who led the assessment, was quoted as saying. This means that vegetation is expanding to higher elevations and farther north, and growing seasons are getting longer. But some areas, such as the headwater region of Asia’s biggest rivers, have become warmer and drier and are being severely affected by desertification and grassland and wetland degradation. And because different surfaces — snow, grassland, desert — reflect and absorb different amounts of solar radiation, affecting how the air above them is heated, changes in coverage are considered likely to affect the onset and strength of Asian monsoons. They are therefore seen as having important ramifications for the livelihood of downstream river communities because the glaciers, permafrost and ecosystems act as a giant sponge, helping to control the release of water and prevent floods. Growing urbanization, obviously resulting especially from unchecked immigration from China, is said to create more waste than the region can handle. Still, a bigger threat comes from mining. 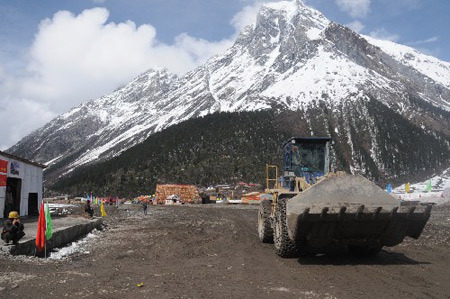 Tibetan mines produced 100 million tonnes of wastewater in 2007 and 18.8 million tonnes of solid waste in 2009, the assessment report was cited as saying. Because most of the mines are open pits and have limited environmental oversight, “air, water and soil pollution is particularly serious.” But officials release few details about actual pollution levels. However, the threats from mining and pollution are said to be dwarfed by the potential repercussions of changes in ice and vegetation cover resulting from global warming. The report is said to suggest that the Chinese central government must evaluate local officials on the basis of their environmental, not just economic, achievements. This is because temperatures in the plateau are projected to rise by between 1.7 °C and 4.6 °C by the end of 2100 compared with the 1996–2005 average, based on the best- and worst-case global-emissions scenarios. So, as urbanization and climate change tighten their grip, researchers worry that unbridled development will devastate the plateau’s environment. The government is also asked to be much more open about pollution incidents.